Creating new content on a regular basis isn't always easy -- especially when you're on a small team. That's why conversion rate optimization (CRO) is such a valuable practice for marketers to master. Because with the help of CRO, you can optimize the content and pages you already have to generate new leads. Just how powerful is it? During the 2008 presidential election, the Obama campaign website saw an improvement of over 40% in sign-up rate after running a few conversion experiments. By the numbers, this optimization led to over 2.8 million additional sign-ups and $60 million in additional donations. That's a huge impact. While experimentation can seem like a big project to take on, learning how to get it right can pay off in big ways. 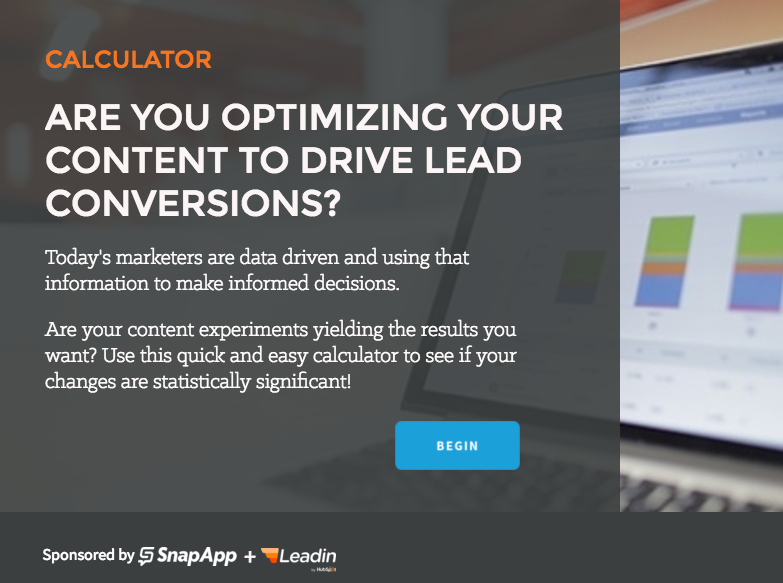 That's why Leadin partnered up with SnapApp to bring you the tools you need to start optimizing your website for more conversions. First, use our experiment template to map out your experiment and start gathering data. Then, plug the results into the simple statistical significance calculator to determine if your experiment has yielded significant results. If it has, finish up the experiment template with your learnings and conclusions, and share the results with your team. Ready to tackle CRO? You can check out the experiment template here. And the statistical significance calculator here. If you have great results, tweet at @HubSpot and @Snap_App with your winning experiments!